Bishop Felipe de Jesús Estévez from the Diocese of St. Augustine, Fla., gives a presentation to priests who attended the Nov. 21 Day of Sanctification at St. Charles Borromeo Seminary. WYNNEWOOD — As Catholics, we can get so caught up in our daily lives that we don’t focus on the priceless gift Christ left us when He instituted the priesthood at the Last Supper. It is the vessel through which the Eucharist, also instituted on that Holy Thursday evening, and the other sacraments are brought to the faithful every day of the year. In the Archdiocese of Philadelphia, archdiocesan priests gather every Holy Thursday at the Cathedral Basilica of SS. Peter and Paul for the annual Chrism Mass to receive the blessed oils that will be used to administer those sacraments, and also to celebrate their “yes” to Christ’s invitation to serve in His priesthood. Once a year is hardly enough for the priests of a presbyterate to come together. With dwindling numbers in their ranks, the priests’ work in the parish is all the more important and time consuming, making such gatherings difficult to coordinate. However, archdiocesan priests do gather for one other occasion annually, usually during or close to Advent: a Day of Sanctification during which they pray, receive the sacrament of reconciliation and reflect on the sacred priesthood. This year, that Day of Sanctification was held at St. Charles Borromeo Seminary Nov. 21, the feast of the Presentation of the Blessed Virgin Mary. The day began with a welcome and opening address by Archbishop Charles Chaput, O.F.M.Cap., who commented that only once or twice before had he ever been in a gathering of so many priests from the same diocese. 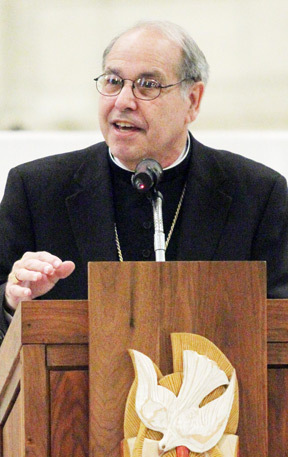 The keynote address was delivered by Bishop Felipe de Jesús Estévez, of the Diocese of St. Augustine, Fla., and former Auxiliary Bishop of the Archdiocese of Miami. Bishop Estévez was born in Pedro Betancourt, Matanza, Cuba, and came to the United States as part of Operation Peter Pan, which was a joint effort between the U.S. Department of State, the Central Intelligence Agency and the Archdiocese of Miami. Between 1960 and 1962, more than 14,000 children were sent from Cuba to Miami by their parents who opposed the revolutionary government. “Mary’s heart was God’s, and you must imitate Mary, who pondered Jesus’ mysteries,” Bishop Estévez said to the priests. “And never forget that the home is the first seminary,” he added. His priorities for priests in St. Augustine are evangelization, reaching out to youth and “estranged” Catholics, as well as championing social issues in Tallahassee, keeping the rights of the most vulnerable in the spotlight by emphasizing the Church’s teaching on issues like abortion, the death penalty, the disabled and immigration. Father Roland Slobogin, pastor of St. Charles Borromeo Parish in Drexel Hill, reemphasized Archbishop Chaput’s directive to promote vocations. “It is important for us, as priests, to communicate with our deaneries and to reinforce relationships,” he said. Father Michael Pawelko, parochial vicar at Our Lady of Good Counsel Parish in Southampton, who was ordained in 2010 and has attended two Days of Sanctification, focused on the simple joy of the gathering. “It’s just nice to come and be with brothers,” he said. The day closed with solemn Evening Prayer in St. Martin of Tours Chapel, followed by a closing address by Archbishop Chaput. “We’re not only called to be Christ’s brothers, but also His mothers, bringing forth new Christians, and we can’t survive in the world today without the encouragement of our fellow priests,” he said. “I come every year and always leave with a sense of hope and optimism,” said Father Henry McKee, pastor of Sacred Heart Parish in Havertown.